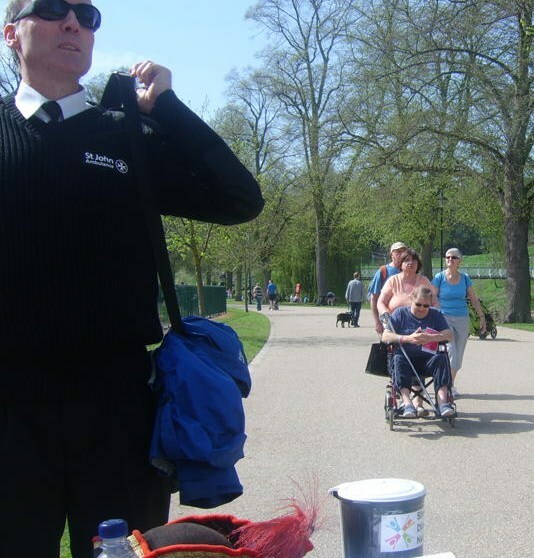 Trevor’s Blog-What a nice day for a “Walk and Roll” an event in the Sunshine. Jenny definitely has her eye on the refreshments ahead after pushing Trevor around the route! As I woke up the sun was flooding through our bedroom window. “Ah, its Sunday” I said, seems like Ruby has managed to get the weather right for the Walk and Roll event, well done Rub’s, its just what we ordered. After some breakfast, tea and a suitable amount of “pottering” it was time to load the “wheels” into the car. Wheelchair on board, we were off, next stop Shrewsbury Quarry Park for the Shropshire Disability Network’s Walk and Roll event. I had been busy all week badgering all and sundry for sponsorship for the event, while keeping a watchful eye on the weather, as I didn’t fancy walking or being pushed around the Quarry in the rain! As it happened, no problems, the Sun was shining and I’d managed to raise over £200.00 in sponsorship. All we had to do now was actually make it around the prescribed route. We arrived at the Quarry and managed to find a parking place near to the event starting point. I unloaded the “wheels” from the boot of the car and we made our way to the start point. At the start there where already quite a few people around in wheelchairs and the looming figure of Martin Woods, the Shrewsbury Town Crier looking splendid in his full uniform. Martin is the Husband of one of our Steering Group members and his services had been sought to announce the start of the event, in some style! 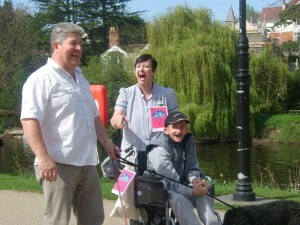 We all smiled for the camera, as we had our photos taken for the Shrewsbury Chronicle. The Town Crier removed his enormous bell from its bag and proceeded to bring things to order, ringing his bell for all he was worth, with his voice booming out from beneath his bushy beard. Martin certainly got the full attention of all of the children playing on the swings and slides to our left and most of their parents. What a splendid way to start our event, after Martin’s starting announcement everyone knew SDN were in the Quarry! We were off, not as many people as we would have hoped for, but the company and the sunshine made up for the lack of numbers. I decided to try to be brave and walked along, pushing my wheelchair. Jenny, my wife was walking with me and soon she convinced me that walking was not going to work and that I needed to sit and let her push! Reluctantly, I gave in and sat in my wheelchair. We rolled along chatting to other walk and rollers and saying hello to lots of well wishers along the way. The sunshine had worked its wonder and the Quarry Park was really busy, people on bikes, people on rollerblades and families out walking, enjoying the beautiful spring weather, there were even people brave enough to sunbathe! The river Severn was also really busy with people practising their rowing, with coaches riding along the riverbank shouting out instructions to their charges on the river. We arrived to the turn around point only to notice some activity going on around Geoff’s, our Chairpersons wheelchair. “My batteries have died” Geoff said, “I fully charged my chair last night, but I think they are at the end of their working life, as they are four years old”. Confusion ensued as we all tried to work out just how to get Geoff’s chair into its “manual mode”. Help arrived in the form of Martin Woods, “oh”, said Martin, “you just pull these out here”, pulling on the bosses in the centre of the wheels that everyone else had been trying for ten minutes! “You need to get some WD40 on those when you get back Geoff” Martin said, with a wry grin on his face. We started to make our way back along the riverbank to the start point. Geoff’s normal PA was having a well deserved day off and luckily her son Shaun was looking after Geoff for the day. “It was much easier walking up here alongside you than pushing you back Geoff” Shaun said as we made our way back. Even though Shaun is a big lad, the weight of Geoff’s chair, and Geoff made Shaun puff and pant a bit. Geoff had yet another job for Julie on her return to work tomorrow, sort out some new wheelchair batteries, fast! We made our way back to the start and sat around a while, awaiting the return of everyone and ensured we were all “booked back in”. Ruby was busy clicking away on her camera, getting some great shots to go onto the SDN web site and to help her with publicity. More fun ensued, trying to get Geoff back into his van without power, a good shove from Shaun and a passer by and Geoff was safe and sound back in his van. “Let’s do it all again next year” was the parting remark from Geoff as Shaun closed the vans tailgate on what had been a fun filled morning in the sunshine. As a final note I would just like to thank the people of Shrewsbury and the surrounding areas who were in the Quarry Park on Sunday, firstly for the general interest that they showed in our event, the very positive comments and observations made to some of our members and for the way that “we”, as a group of wheelchair and scooter users were made to feel most welcome in the Quarry without any prejudice along with all of the other people out enjoying the spring sunshine and a very special thanks from Shropshire Disability Network to anyone who kindly gave us a donation on Sunday. As we intend to make this an annual event, why not consider coming along and joining us next year, “wheels” not compulsory! This entry was posted in Blog on April 12, 2011 by Clear. Great storey. What a fantastic day! Can’t wait to see Ruby’s pictures.